Little girl running in beautiful mystic old town. Back view slow motion. Paved street, half timber houses and cemetery. Woman walking with boy and girl, holding hands. Mother, two little kids. Half-timbered houses Hattingen Germany. 4K. 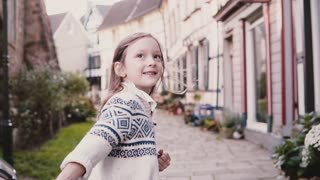 Little girl walks to camera, relaxed and smiling. European mother together with two kids. Half timber houses Germany 4K. Adorable European boy singing in the street. 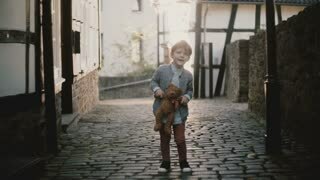 Male child holds a teddy bear. Talent expression. Old paved town road. 4K. 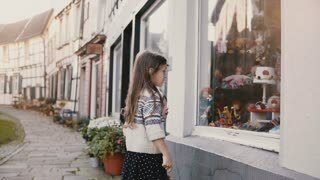 Two little kids stand, look at a toy store window. European children talk near storefront. Half-timbered houses. 4K. Two little kids making faces, dancing outside. 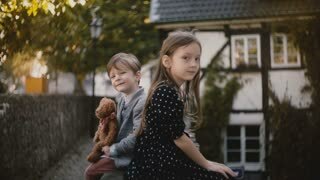 Caucasian girl and boy with teddy bear. Half timber houses background 4K. 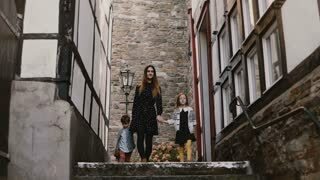 Mother walks with two children, holding hands. 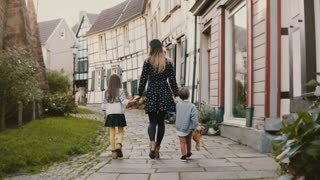 Woman, little boy and girl between amazing half-timbered houses. 4K. Camera follows little girl running on paved road. Back view. Ancient half-timbered houses in Hattingen, Germany. 4K. Little girl and boy stand together making faces. European siblings look at camera smiling silly. Half-timbered house 4K. 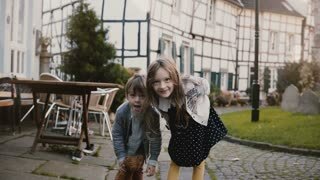 Portrait of little European boy and girl. Brother and sister sit together looking at camera. Half timber houses. 4K. Little girl in black dress running on old road. Back view slow motion. Half-timbered houses. Happy carefree childhood. Little girl looks at camera, runs on paved road. Back view. Slow motion. Cute European child running in old street. 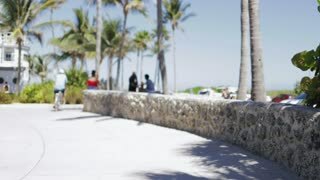 Back view of anonymous brunette in sportswear running on paved alley in tropical sunlight working out in morning.